The New Brunswick Galaxy 170 S CO2 Incubator from Eppendorf is a high capacity incubator that’s easy to operate and cost effective to run. This CO2 incubator is designed to maximize space inside, yet small enough to keep under a bench or stacked two high. Inside this laboratory incubator is an easy to clean, seamless stainless interior, with a fanless design adds more workspace while reducing the amount of potential contaminated surface area. Instead, this 170L capacity CO2 incubator uses a six-sided direct heat, giving you a uniform environment with no airflow to disturb delicate samples or powders. This lab incubator also has a sealed inner glass door that allows users to check on progress without disturbing the environment. This CO2 incubator features humidity control, up to 95% at 37°C with a 2.5L capacity reservoir. Parameters for this microprocessor controlled CO2 Incubator can be programed and alarms set from the user-friendly LCD display screen set up at the top for comfortable use. This lab incubator will also connect to a PC for data logging through the RS-232 communication port and features a 25 mm access port for external monitoring, as well as remote alarm contacts, and a dependable IR CO2 Sensor. 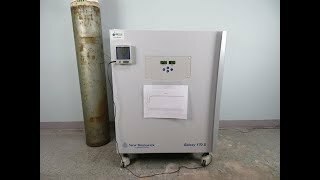 This New Brunswick Galaxy 170R CO2 Incubator has been thoroughly inspected, and was calibrated at 7% and 14% CO2 Concentration Running at 37°C. All of our lab equipment comes backed with our standard warranty. Should you have any questions, please don't hesitate to contact us. Please note the picture CO2 tank is for testing purposes and is not included.